The source springs are located near Ridgeway Farm at East Compton at an altitude of approximately 148 metres above sea level. From here the waters travel westerly to flow beneath the B3136 and then on to West Compton. During a dry summer this section of the river can be dry. At West Compton waters from Knowle Hill join the flow. 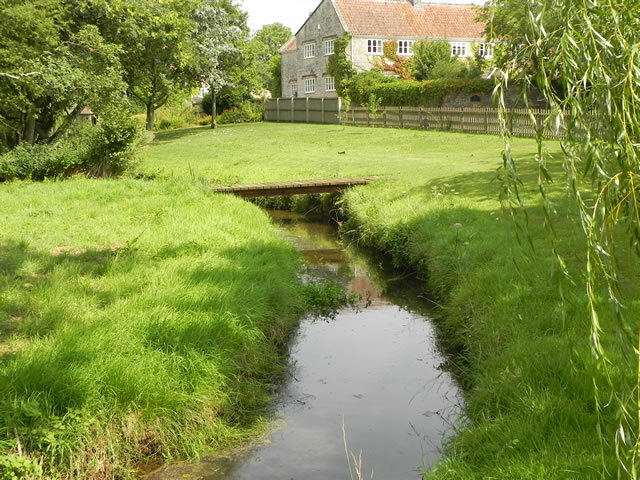 The river’s journey to West Compton covers approximately 1.25 miles with a fall from the source of approximately 63 metres. From West Compton the river continues its westerly direction to the south of Knowle Hill through Compton Woods and Batch Woods to Stoodley Bridge in the valley below Stoodley Hill. Just before reaching Stoodley Bridge, waters join first from the north near to Dungeon Farm that run down the valley between Knowle Hill and Worminster Sleight and secondly from the south by waters that form east of Burford. The journey from West Compton to Stoodley Bridge is approximately 1.25 miles with a fall of approximately 52 metres. From Stoodley Bridge the river continues westerly for approximately 0.25 miles where the flow turns to a south westerly direction to North Wootton. The river here once provided power for a corn mill and a bark mill and tannery. The mill leat of the corn mill, although dry, is still visible. Travelling through North Wootton the river passes beneath a late C18 listed stone footbridge. The total distance covered by the river when it reaches the bridge on Stock’s Lane, North Wootton is now approximately 3.5 miles with a total fall of 133 metres from the source at East Compton. The river distance from source to the join with the Hartlake River is approximately 6.5 miles, and with the Hartlake River join being just 6 metres above sea level the fall from the source at East Compton is approximately 142 metres.